Abu Dhabi: Within the next decade, every residential and commercial unit in the capital is expected to have a green space for rest and relaxation within a 200-metre radius. As planners work to achieve this vision, the Abu Dhabi City Municipality is also rehabilitating existing parks and public spaces to keep up with the needs and demands of today’s residents, officials said in the capital on Monday (March 25). This rehabilitation includes the incorporation of food trucks and retail kiosks in parks, the installation of washrooms, and the setting up of smart play equipment to further engage young park-goers. “Many of the existing spaces in the capital were initially developed to increase the amount of greenery, and incorporated just expanses of grass and trees. Today however, we ask more of these parks, looking for avenues for relaxation, for a quick coffee while we relax, or for our children to be engaged in play. This is the vision that is currently driving the development of Abu Dhabi’s parks and playgrounds,” Benjamin Heydon, landscape consultant at the Abu Dhabi City Municipality, told Gulf News. He was speaking on the sidelines of the Future Landscape and Playspaces conference, where developers met with government officials and industry experts to discuss the growth and improvement of public spaces. 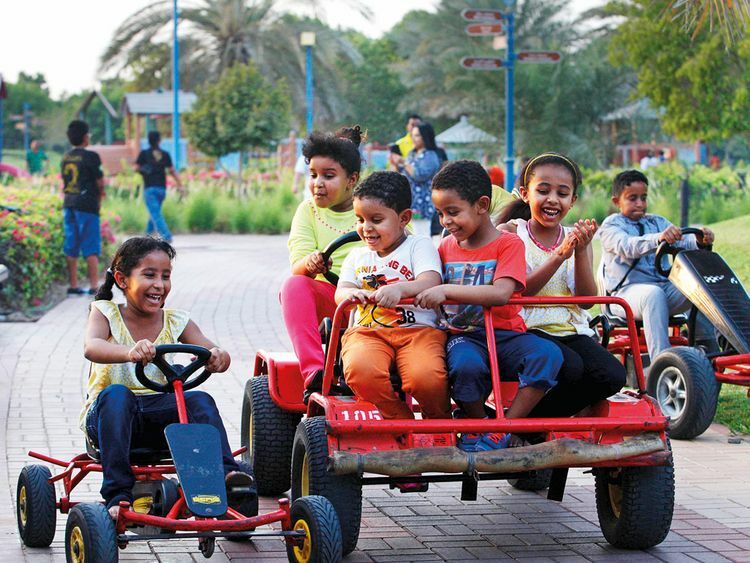 Parks are an ideal place for communities to interact, and their development is therefore a priority during the UAE’s Year of Tolerance, said Mohammad Al Shateri, section head for studies and standards at the Municipality. To that end, a number of smart play devices have already been installed along sections of the Abu Dhabi Corniche as part of a pilot project. These essentially use the kinetic energy of play equipment like swings and seesaws to generate light and sound, therefore making the play more interactive. “While traditional play equipment is still loved by children, these new devices provide an added dimension because they also make use of technology and mechanics. Children today love using smart devices, so why not add them to parks and make the outdoors attractive,” Heydon explained. At the same time, the municipality is working to set up more washrooms in public places. “In the past, a number of self-cleaning washrooms were also installed, but they were not used widely. Perhaps a redesign is needed, or they have to be placed in more accessible yet private locations, and this is what is being looked into,” Heydon said. In the meantime, the municipality is continuing to refurbish existing public parks in the capital. Last year, a key project saw nearly 30 new barbecue stations being set up so that more park-goers can easily grill food during their outings. And earlier this year, the Municipality announced that it had revamped the Capital Garden, and Al Zaafaranah Park, removing the fencing around them. “The parks are now also renovated to include shaded walkways, room for kiosks, and a variety of play areas geared to children on different ages,” the consultant explained.